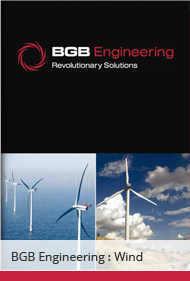 BGB have been delivering engineering solutions to the wind industry since the early 1990’s. 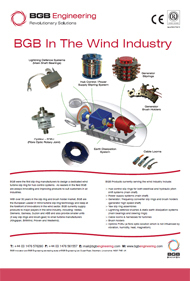 With over 65,000 products situated in over 77 countries worldwide, BGB is the number one wind turbine slip ring solutions provider. We remain at the forefront of turbine technology and work closely with major wind turbine manufacturers such as Vestas, Suzlon, ABB OY Machines, Gamesa, Siemens Wind Power, Goldwind, Guodian, Nordex AG & WinWind. Products have been developed to function in the most extreme turbine environments. An extensive range of cable looms and connector systems are available to provide complete rotary solutions. Click here for interactive BGB Nacelle Products page and Ipad presentation to see where BGB products are located in the nacelle.